I’ve been thinking a lot about them lately. This past Wednesday two women I greatly admired entered God’s presence within hours – perhaps moments – of each other. Trudie was “Oma” to our son-in-law Ben and great-grandma to our precious Libby and her baby brother Everett. I have slept under the quilt Trudie made that covers the bed in my daughter’s guestroom. I sat side by side with her at dinner not three weeks ago. Trudie’s fingerprints of love were all over the life of her family. Her funeral is tomorrow. As we were processing the news of Trudie’s loss, we were stunned to learn of the death that same morning of a very close friend on the staff of our church. As my husband shudders through his grief at Shirley’s sudden passing, he is also preparing to co-officiate the family memorial service next week for his beloved eldest sister, Jeannine. We have been grieving Jeannine’s premature death since March. The extended Rowe family and our friends gather in West Virginia to remember her on Monday. Each of these women had a physical home unique to her season in life. A place to host family and friends, offer hospitality, rest and recharge. Each woman left her home without warning – no time to cross the t’s or dot the final i’s of life. Each woman exchanged an earthly address for a heavenly one. You know how it is. When times are tough and grief saws at your soul-edges, you don’t need a commentary. Couldn’t take it in anyway. But a one-word-a-day companion that strengthens you to dwell in God’s peace, his presence? 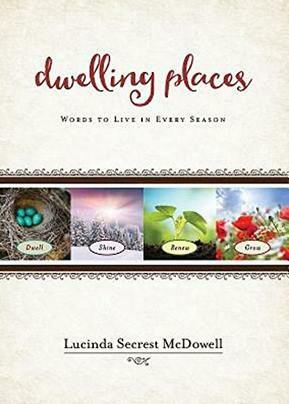 In her new release Dwelling Places (Abingdon Press, 2016), New England author Lucinda Secrest McDowell unpacks single words – mercy, beauty, gratitude, grace – through readings rich in robust theology and beautiful in their brevity. The mind prone to wander, distracted by grief, can rest here, sit a moment. Reflect. Remember. Recalibrate. “My child, each person’s days on earth are numbered. And that’s why I want you to live every one to the fullest. Remembering my promise – that I am always right beside you. The more you practice my presence the easier it will be for you to turn to Me at every moment. Don’t worry about the end. Just live today in complete confidence and care. And courage. I’m with you. My friend down the street who is unemployed and may lose her home? I gave her Dwelling Places. The mom and teens without a home at present who have been sheltering with us for a spell? I’m getting them Dwelling Places. As for Jeannine, Trudie, and Shirley? They don’t need to read about God any longer. They have met him face to face. 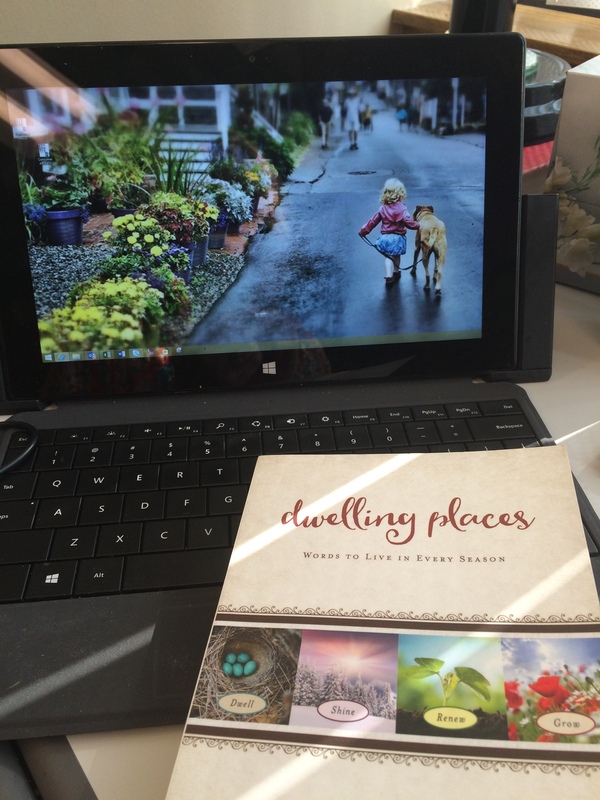 If you’d like to win a copy of Dwelling Places, Abingdon Press is sponsoring a Refreshing Summer Giveaway with lots of great prizes including a copy of Dwelling Places. Click here and enter your email for a chance to win. Beautiful as always Maggie. You have such a gift with words. You pen so wonderfully what many of us think and feel. I am so very sorry for these three losses in your life. It becomes very difficult, more difficult with every passing year it seems. My heart goes out to you, and I’m praying for you, your family, and your FBC family, for hearts to be healed in His timing and for the Holy Spirit to be your Comforter. I am also rejoicing, that these three beloved ones are “home” rejoicing with their Savior. You have the confidence that you will see them again, like so many other dear ones who have gone on before. Please keep writing, and sharing with us, and please remember you are all truly in our hearts and prayers. As always, Marji, you are communicating so well and express what people feel. I will continue to pray for you as you process all of these changes. Praise God that our hope and confidence are sure and that we know where Trudie, Shirley and Jeannine are. Praise God that we will join them and will forever worship our Lord in person too! Have a good week. Love you so much.